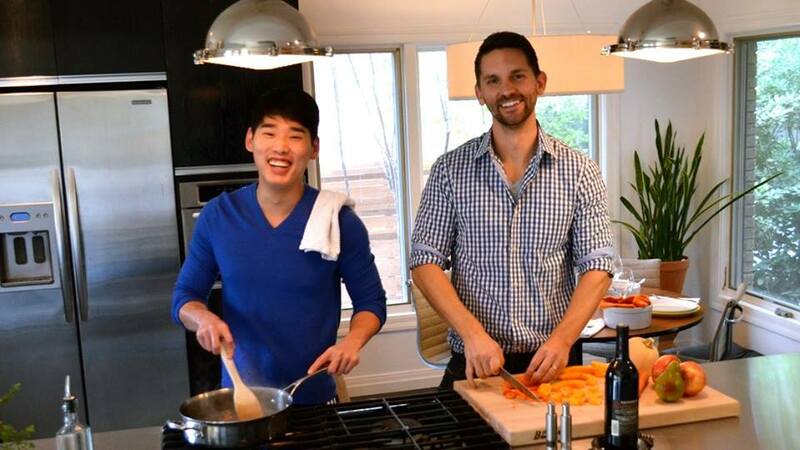 queer in the kitchen was founded by friends, John Boerger and Kyle Tatum, in October 2012. What began as a common interest in all things cheese and butter (as well as the shame following said meals) blossomed into a realization that they wanted to share what they were doing in their kitchens with everyone… or at least the everyone not fortunate enough to have a fabulous gay in their life to dispense culinary advice and inappropriate jokes (with cocktails to boot). Remember that time you went to a ‘quaint’ dinner party that ended up being nicer than some weddings you’ve been to? queer in the kitchen is nothing like that. Some gays are obnoxiously good at taking something simple and elevating it until it’s barely recognizable. This blog is not for those gays. This blog is for those who appreciate the finer things in food and entertaining, but would rather have fun a few glasses of cabernet than execute a perfect soufflé without breaking a sweat. This kitchen is for laughter, cocktails, friends and the occasional shirtless chef. Neither founder has had any professional training in the culinary field. Both are actually hair stylists in Dallas. Most recipes are the result of trial… and even more error. You’ll see a wide array of recipes and tips that appeal to every skill level in the kitchen and walk of life. queer in the kitchen‘s goal is to slowly guide you, step by step, to becoming the marvelous cuisinier you already are under all that restraint. So let your hair down, or better yet, PUT ON A WIG! 20 Responses to "about us"
So informative and presented so well! This is my new favorite site. I love food. And gays. I also felt the same way about my Kitchen Aide. It’s going with me for Christmas to Northwest Akansas to make my traditional holiday gay favorite Warm Apple Walnut Spice Cake with Creme Caramel Sauce and Creme Fraiche by Dallas’ very own Chef Stephan Pyles.. Your blog is fantastic! I am so excited! Saw the write up in Gay List Daily. How do I sign up to receive the montly blogs or whenever you send out information? We now have a subscribe link on our home page in the right sidebar. Now you’ll get it while it’s hot! Spot on guys. Keep of the delicious work. I like to see all the ideas and the things to make it with. I also like how you show when it is finished. Many good tips can be found in these simple ideas and they all really taste good also. The personal pics are great also. Thanks for making my day. I throw about two dinner parties ( 8 people ) a month. After a while I get bored with the same 4 dishes ( and so do my guest ). Do you have any dinner party menus that doesn’t keep me nailed to the stove? I’m so busy cooking, that I don’t get to visit with my friends, and I feel like I’m just a Soup Kitchen to them. Oh yeah, one more thing….. we’re all health conscience. My guest look at a stick of butter like it’s Syphilis. Thanks ! Funny you should ask that. Just the other day, we were talking about doing a whole start to finish dinner party like we did with our dinner for two post a few months ago. We’ll work on this! I am thoroughly enjoying your blog. You have the most delicious recipes! I’d like to be the first one to buy your cookbook one of these days….autographed, of course. Love your website, creative recipes and superior wit!!! Hi guys! I just made your Fit Stuffed Bell Peppers and they were gosh-darned good! It was my first time to cook with Quinoa and was pleasantly surprised how much it added to the taste and texture of the dish in a great way! Excellent recipe! !